The Lexmark E350D is a good monochrome laser printer, though a bit pricey compared to its competitors, featuring a built-in duplexer, offering great print quality and expandable paper handling and memory. The cartridge design is ecofriendly and Lexmark offers replacement cartridges at discount if they will get the used ones back. Though this printer is pretty much over the hill now and will probably not be produced by Lexmark anymore, we recommend you to take a shot with it, as this model is a very good one for personal use. The printer's speed is good, with the device working at a 35 pages per minute rate. The printer's speed for black and white duplex printing is up to only 16 pages per minute, but that's not a bad value for such a size. Compared to three other direct competitors, the Samsung ML-3051ND, the Brother HL-5050D and the HP LaserJet 1022n, the Lexmark E350d works with almost 6 seconds per page faster than the Samsung, and with more than 10 seconds per page faster than the HP. The printer works at a maximum resolution of 1200 x 1200 dots per inch. 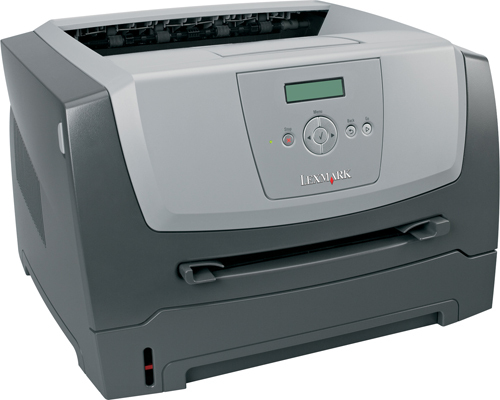 The Lexmark E350D features a built-in duplexer, which allows automatic two sided printing. This is an important feature when a company will look into buying it, because it helps cutting costs down. The device is powered up by a 366 MHz processor and helped by a pre-installed 32 MB RAM, expandable to 160 MB through DIMM slots. The connectivity can be done through a Parallel IEEE 1284 port and the standard USB 2.0. The languages installed on this printer are the following: PCL 6, PCL 5E, IBM PPDS and PostScript 3. The monthly duty cycle is set at 35.000, putting this printer in the small workgroup category. Lexmark advises the users not to surpass this value, as this will considerably decrease the printer's life cycle. The Lexmark E350D supports the following media types: cards, labels, envelopes, plain paper and transparencies and can print in many sizes: C5, A4, A5, B5, Folio, Legal, JIS B5, Statement and Executive. The maximum media size is 8.5 by 14 inches. The device is certified for Windows Vista (so it will work very good with Windows 7) and is compatible with Linux and Mac. The printer's dimensions are 10.2 by 15.6 by 14.1 inches and it only weighs 25.1 lbs. With this kind of values the printer is clearly designed for personal use. 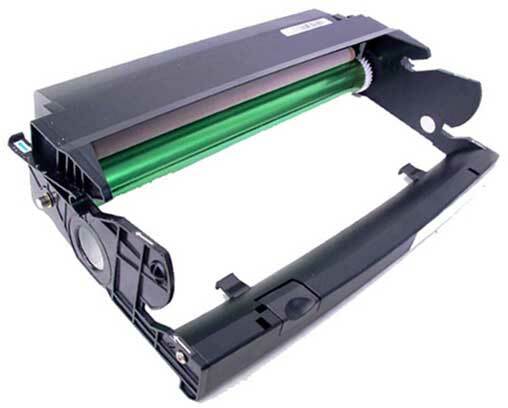 The Lexmark E350D delivers excellent text quality with clear and sharp characters. The monochrome graphics quality was not so good though. The details are sharp, but some minor cross-hatching are marring the photo graphics. There are also some minor compression in the dark end of the grayscale. The Lexmark has the upper hand when talking about quality of the color above two of its other competitors we talked about earlier (the HP and the Brother), while standing at the same level with the Samsung. The input is assured by a 250-sheet input tray, which is not an impressive one. The output tray is a 150-sheet one, which is again not very good, so that's why we've decided to put those features in the cons category. That's simply not good enough compared to what you can get for the same price. However, with the optional input tray the printer can hold up to 800 sheets, but you will have to pay for that. The printer is not network compatible, so if you would like to have this feature, you will have to additionally pay for it. Is good Lexmark offers this feature too, but the fact that the buyers have to pay for it is not likely to make them favors. The device works at 52 dB, which is a bit high for such a small printer. Review it: "Lexmark E350d "
The printer will come in the box alongside the following: driver and software CD, power cord, help documentation and default toner. Lexmark recommends using the following cartridge type for replacement: Lexmark E250, E350, E352 Toner Cartridge (#E250A21A). This product yields around 3500 pages and has a two year shelf life. 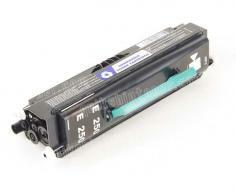 If you want to have a higher quality cartridge, Lexmark offers the E350 High Yield Toner Cartridge (#E352H21A). This one yields 9000 pages at the same coverage as the first one: 5%.